Live From The Wang: Ring Ring:BSA - It's the Clue Phone,It's For YOU! So last year, when the big boy was in kindergarten, he was mistakenly given a flyer about being a cub scout. He came home ecstatic and that afternoon he and his father went to the school to sign up. He came home crushed, absolutely crushed, because he wasn't OLD enough. We enter 1st grade and AGAIN we get the flyer about being a cub scout. We ALL go to the sign up meeting and sure enough, there is a legion of grown ups in their boy scout regalia taking our money and giving us forms to fill out and and giving us flyers about ALL THE EVENTS THAT WE ARE GOING TO HAVE and guess what the whole family is expected to attend. I'm not even getting into how bizarre that is compared to the Girl Scouts. But my problem is this, they took our money, we shelled out money for a UNIFORM and by the time it was said and done, they didn't have a troop leader - den leader - whatever. Nor did they have a PLAN. But they did have $200 of our money. You would think, that an organization as old as the Boy Scouts would have a PLAN - after all, their bumper stickers proudly proclaim - 100 years of Scouting. Isn't their motto BE PREPARED? Well lemme tell you, they aren't. We had a pack meeting (that's where all the dens get together once a month). No word about a den meeting. We had another pack meeting. No talk about a den meeting. When we finally start getting communication - they suggest WE do it. Don't get me wrong. I was in scouting for years. And if we didn't have TWO - count'em TWO special needs children and a baby on the way - I'd entertain it. I don't have any problem pulling our weight and participating. But it just isn't feasible or reasonable. I said something to one of my coworkers who is one of the grand poobahs locally and some other leader held a den meeting. ONE DEN MEETING. We joined in August. At that den meeting it was again suggested that we be the leaders. Or my husband do it. Oh - and during sign up - there were so many kids joining that it would've been TWO dens. At the only den meeting held, there were TWO KIDS. My kid, and another. Basically - they lost two dens worth of cub scouts because of their failure to adhere to their own motto - BE PREPARED. At our last pack meeting, the big boy got a badge. Why? What did he earn a badge for since we haven't DONE anything? I don't know. YOU TELL ME! I'd feel worse, but the parents BEHIND ME also didn't know why their kids were getting them,and they were older than my kid AND IN ACTIVE DENS. So this weekend, we took a boat that the big boy had painted - one he had been given at his ONLY DEN MEETING (I'm peeved about that can you tell?) 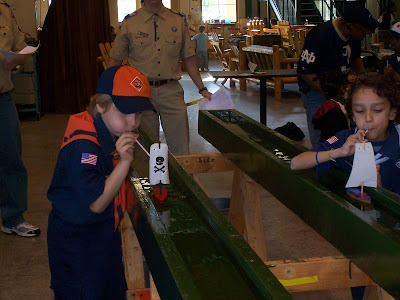 and attended the pack's raingutter regatta. He was the only "Tiger Cub" present. I am sure that this is because the other boy has ALSO dropped out now. He lost both of his races, but won 1st prize for best design. Oh what was the prize? Oh there wasn't one. Apparently it didn't occur to anyone that there should BE prizes. So I am now going to help you out, Boy Scouts of America. I am going to help you with some words of wisdom from someone WITH a clue. Everyone has to know what is going on. This means you have to speak loudly, and clearly and concisely. I know you're very worried about some prayer you wrote - but Jesus wants you to SHARE information, not just mumble prayers that no one can hear. Have a plan. I cannot stand to watch 5 adults in the front of a room and none of you know what you are doing, reading from papers you haven't looked at before THAT moment in time. Seriously, it's cool if just ONE of you does it all - as long as that one is prepared. Jesus wants it that way also. He likes it when you don't look stupid. Initiate and instill camaraderie. See - the biggest thing that children, especially young children, learn in scouting is camaraderie. It's the forging of friendships that isn't built around television and video games. You would think, if nothing else, that experienced leaders would be prepared to pick up one extra den meeting a month VS. sacrificing two entire dens. Some of you people live and breathe this stuff-I know you do, I can tell by how well pressed your uniform is. You are failing. Spend less time ironing, more time figuring out how to include EVERYONE. My little boy has been told by the BSA that he is unimportant to them. He is only 7 so he doesn't perceive this. But I do. It's even been suggested that we just "go through his handbook with him". Wow, cuz that's fun. Yeah, but he looks SUPERFLY in that uniform. That makes it almost worth it. 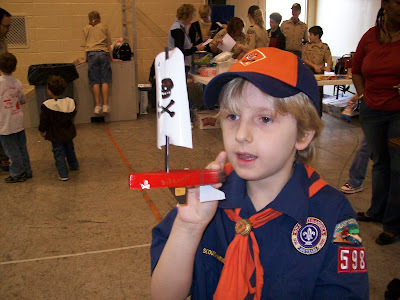 My own son's involved in Scouting (just earned his Bobcat rank back at Hallowe'en), and I've been doing some research. The home office in Texas has a plan; they've been quite capable at it for that hundred years. Oh, and I agree; he does look good in that uniform!